Close your eyes and you could be transported to a western classical music capital. Such was the high quality of the rendition by the NOTOS Quartet, four young musicians visiting from Germany currently attached with respected institutions in Europe. The NOTOS performers demonstrated their individual virtuoso and ensemble classical music skills in their technique and performance at Dhaka this week, courtesy of the German Embassy and Goethe Institut. 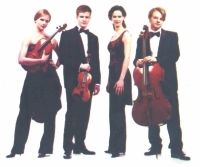 Sindri Lederer (violin), Liisa Randalu (viola), Florian Streich (violincello) and Antonia Koster (piano) - all exuberant young musicians - received training in the Western classical genre in various countries of Europe since very young. Their youth is certainly not to be mistaken for their level of performance. The evening opened with Spanish composer Joaquin Turina's Piano Quartet in A minor Opus 67. A mature cyclic composition in three movements – slow, (lento) fast (vivo), not so fast (andante-allegretto), alternating in repetitive sequences of energetic and languid lines of vibrato (rapid re-iteration on a tone) and portamento (gliding smoothly from one tone to another) masterfully crafted with no ambiguity in the parade of the mysterious Spanish flavour in the notes, the melody lilts, embellished just so in-between, which the violinist seemed to address with content. This seamless knit of French classical sophistication and Spanish Andalusian folk character offered partnership of Antonia's piano's luxuriant tones with the three fervent strings. Not being an especially dynamic piece but rather evocative, the musicians achieved the moods and colours inherent in the piece adroitly. In the second half, the NOTOS quartet played Brahms Piano Quartet in G Minor opus 25 - which composition is sometimes referred to as “miraculous”, comprises four parts - allegro (fast and lively tempo), trio animato - intermezzo ( a lighter piece that is inserted between two greater movements/verses), allegro /ma mon troppo (fast – but not too much), and rondo alla zingarese (episodes in contrasting placements with one refrain) for nearly 40 minutes. Brahms composed the piano quartet in 1861 when he was only 28 years old and is the third of some 26 of his chamber music masterworks. This quartet is well reputed for the last vigorous “rondo” part - being the masterpiece of melody and rhythm and a brilliant stylized exotic and rustic Gypsy composition of contrast, usually heard in Hungarian dances and rhapsodies and available in compositions of Beethoven, Mozart, Haydn etc. The slow movement of the intermezzo features the subdued piano of Antonia Koster accommodating the often busy strings of the violin, viola and cello ensemble, with her light deft touch of the ivory and at once with her fiery attack on the keys, belying her frail physical appearance. One starts to note hints of gypsy already in the “andandante con moto “ where the piano and cello seem to vie for the ascending runs with blistering pace and with the pianist tinkling over plucked notes and tremolos of the strings immolating the senses with delicious gaiety giving the effect of a summer romp on a field of light hued flowers in a dreamlike sequence. The lilting allegro mon troppo of violin and piano notes traces Brahms forbidden love for Clara Schumann, which Nietzsche referred to as the composer's “ penchant for the unsatisfied”, in a happy guise, with all three strings and piano precisely conveying to the listener the composer's emotions - delicate and tender. Florian Streich's warm melancholy cello sits passionately in the background now and back to the fore again to Antonia Koster's impetuous piano movements and Liisa Randalu's ferocious rasping on the viola. Florian's impassioned and vigorous violincello subdues tenderly to the andante while Antonia's soft and tender piano contrasts with her fiery handling of the keyboards with equal ease. The finale opens with Sindri's violin leading to a thrilling feverish mix by the strings. Performed in a 2/4 meter, with accent on the first of three syllables, the composition creates the sound of the gypsy dulcimer through the quick and ringing sounds of the piano. The intricate rondo structure alternating with dramatic release of wild joy, typical of Hungarian frenzied zal gypsy music, confirms the virtuosity and expression of each individual musician through their interplay of majors and minors, the realisation of emotional turbulence and visceral intensity present in the composition, continuously charming, exciting and extracting the listener's delight . Santa Claus came in May this year for me bearing the fab four of the NOTOS Quartet– the best gift I have received in Dhaka in a long time.